I love the Saturday giveaways! This would be great for a boy’s bday present. Love love totally target! Thanks for all u do! I already like this site on Facebook. Love it love it love it!! What a great giveaway!! This card is a cool one! Just found your site today!!! Already like TT on FB…LOL!! Thanks! This would really help with groceries! Love your weekend gift card giveaways…thank you for having them. I went to your FB today too and “liked”!!! Thanks for this great giveaway! Hope I win. Am a TT facebook fan too!! i hope i win this giveaway! l like you on Facebook as Kipper Jo. I follow Totally Target on FB!! Would love a Target GC! Thanks! My kids would love the tattoos. Thanks for having such wonderful giveaways!!! Super cute! I love this giveaway! Just liked you on Facebook as well! 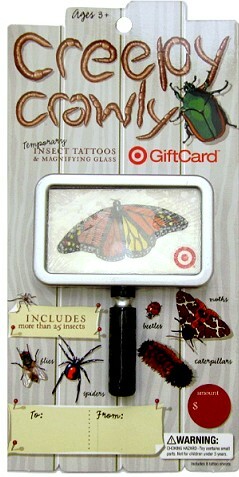 I would like a creepy crawly gift card!